Elgato's original Turbo.264 impressed everyone. Like this new model, it was a small USB dongle containing a dedicated co-processor for encoding video into the H.264 format that has become the standard for iPods, the Apple TV, Blu-ray, and modern, flash storage-based DV cameras. It only did standard-definition, however, and in the couple of years since its launch, high-definition (HD) has become more popular. 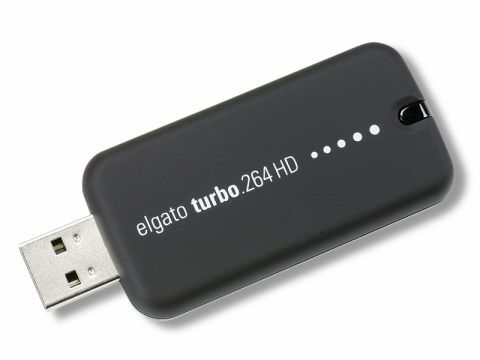 Step forward, then, the Turbo.264 HD, a version that will encode all the way to full 1080p HD. "But I've got a Mac Pro," you think, you lucky swine. Doesn't matter; using Handbrake, our quad-core 2.66GHz Mac Pro encoded a 43-minute, 720p movie in almost real time, but the Turbo.264 HD slashed that encoding time to just over 18 minutes. Best of all, the Mac Pro's processors were maxed out during the Handbrake encode, while the Turbo.264 HD's shouldering of much of the grunt-work left half the capacity free during its encode, letting you get on with other stuff. The software is good; just drop in your source video files – there is tons of supported formats – pick the output type and click Start. You can create your own presets, and it will add the resulting video either to iTunes or upload it directly to YouTube for you. It works directly with AVCHD camcorders, too, letting you view, trim, and join movies together quickly and efficiently.